There were no shocks in the quarter-finals of the Willoughby Cup, with favourites Swineshead, Spilsby and Leverton all going through to the last four. The other tie between Billinghay and Friskney was postponed following Friday’s downpour. Two goals apiece from Jordan Turner and Jordan Smith helped Spilsby Town breeze through to the semi-finals after a 4-1 away win at Old Leake. The home side were always second best, although they could have taken an early lead when Adam Tempest forced Adam Marsh into a good save. Spilsby were ahead inside 10 minutes but the goal did have some sort of good fortune about it as young goalkeeper Owen Richardson palmed a shot out, only for the ball to fly back into the net off a lurking Town striker’s knee. Leake grabbed themselves a lifeline just before the break when Adam Tempest sent over a corner and Kane Watson, one of the smallest players on the pitch, popped up to send a header flashing into the net. Old Leake did enjoy their best spell of the game during the early stages of the second half before Spilsby wrapped up the tie in the final 20 minutes with three goals to run out 4-1 winners. Leverton moved into the semi-finals with a hard-fought win against Benington. Curtis Revell got them off to a flying start with a smart turn and finish after just five minutes before Gavin Bell converted a penalty to level just three minutes later. The half looked to be ending all square until Toni Pascu was brought down on 39 minutes and he duly stepped up to restore his side’s advantage from the spot. Benington felt they had a good shout for a penalty right on the stroke of half-time but their appeals were waved away. The second half was a much livelier affair, with both teams determined to secure a place in the last four, but it was Leverton who struck the next blow when Revell doubled his tally for the day to make it 3-1. Ben Lawrence headed Benington back into the game at 3-2, only for Leverton to wrap up the tie with Revell and Dom Goddard making the final score 5-2. The match between Swineshead and Skegness Town Reserves required extra time to produce an outcome. Kieran Rose’s double and another from Rob Masters edged Swineshead through while Dan Reid and Charlie Arabin replied for the visitors in a 3-2 score-line. There was only one game in the Taylors Garages Premier Division, and that saw Ruskington Rovers coming away from Boston College with an emphatic 5-0 away win. Sam Jackson (two), Ashley Farmer, Matt Leonard and Liam Tait were all on target for Ruskington. In the Taylors Peugeot Division One there were victories for the top two sides as Fulbeck United narrowly edged through at Horncastle Town Reserves 2-1, while Railway Athletic enjoyed a 3-0 away win at Swineshead Reserves. 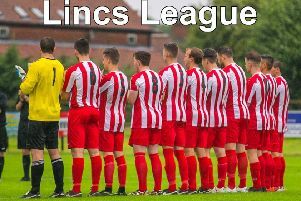 Goals from Chris Bates, who scored twice, and Dylan Grocock saw Fulbeck return home from Horncastle with three crucial points. Ryan Beaumont replied for the home side. Railway made the short trip to Swineshead needing three points to remain on top of Division One. The first half was a cagey affair in difficult conditions with strong winds and an uneven surface making for disjointed football. A 0-0 half time score line was probably about fair to both sides who toiled away to the best of their ability. Railway started the second half much brighter and some real quality on the edge of the box saw Curt Yeatman open the scoring with a left-footed strike straight into the top corner. Their lead was doubled through Nicky Frost when he found himself unmarked at the back post to fire home. The result was put to bed when Ollie Walker fired a ball low across the box to the unmarked Frost to tuck away his second goal of the game from close range and make it four goals in two games since his return. The 3-0 scoreline and a second clean sheet in two games for Mark Haynes was secured when he made a great unorthodox save with his face two minutes from time. Freiston and FC Kirton shared the points in a 4-4 draw at the Danny Flear Centre. Tom Bates struck two goals for Freiston with Perrie Dale and Ty Fravigar also getting on the scoresheet. Two goals from Luke Barnett helped Old Doningtonians overcome Kirton Town in their home match. After falling behind to Kirton’s opener, Barnett levelled the scores at half-time. A Danny Goodacre free kick led to the Dons’ second goal after the break when Mark Sharman shifted the ball from one foot to the other before firing home. Barnett grabbed his second goal of the game with five minutes remaining when he broke through and fired home a shot into the top corner. There was still time for Kirton to reduce the arrears when Dons defender Josh Wilson diverted past his own goalkeeper to make the final score 3-2. The game between Fishtoft and Fosdyke was postponed. Goals from Reece Snade and Joe Lote helped FC Hammers to a 2-1 home win against Coningsby Reserves in the Taylors Ford Division Two. Lee Marshall grabbed the Coningsby goal. Spilsby Town Reserves came up against a strong Billinghay Athletic Reserve side and, despite scoring through Louis Frankish and Dom Griffin, they went down 4-2. Billinghay’s goals came from Elliott Kelsall, who hit a hat-trick, and Adam Underwood-Harley. In the Taylors Vauxhall Division Three there was a huge win for Holbeach Bank who hit Old Doningtonians Reserves for 10, while Boston Atheltic kept their promotion drive on course with a 3-1 home win against Northgate Olympic.